RateSetter are one of the most well-known peer to peer lenders in the UK. In this RateSetter review, we look more closely at the company through the eyes of an investor. We examine how the investment process works and what kind of returns you can expect to see. We’ll also answer that all important question of whether or not your money is safe with RateSetter. RateSetter* started life in 2010 and are one of the most recognised peer to peer lenders in the UK. They have won many awards including ‘best peer to peer lender’ from investing publication ‘Investors Chronicle’ 3 years running. They are best known for introducing their ‘provision fund’ to peer to peer lending. This fund is the primary reason why none of RateSetter’s 58,000+ investors have lost money during its 7 year existence. Now that you have some background on RateSetter, you may be wondering why somebody might want to invest with them? Especially when you could just leave your money sitting in a Cash ISA or some other type of investment. The answer is that the interest rates on offer from RateSetter far outweigh those you’ll receive on standard savings accounts. The company also don’t charge any fees to invest, which is a real bonus. How Does RateSetter Work for Investors? RateSetter connect investors who want to lend with individuals or businesses who are looking for a loan. To start the investment process, the first thing you’ll need to do is to register your details on the RateSetter website* and then decide how much money you’d like to invest. The most popular RateSetter account is The Everyday Account. There are no limits on the amount you can invest with this type of account. You can also invest as either an individual or as a business. The company also recently launched the RateSetter Innovative Finance ISA. This works in the same way as the Everyday Account but earnings in the Ratesetter ISA are tax-free. Once you invest your money, you’ll then need to decide what rate of interest you want to receive. Ratesetter offer you the option of choosing how much interest you want to earn on the money you invest. However, Ratesetter will also recommend a ‘market rate’. The market rate will give you the best chance of lending out your money and earning interest from the start. For example, if the market rate is at 5% but you set your rate at 7% then your money would only be lent out if there is enough demand from potential borrowers. If you select the suggested market rate, however, you’ll drastically increase the chances of matching your investment with a borrower. How much interest you earn with RateSetter is up to you, as you can set your own interest rates. To ensure money gets lent out and starts earning interest quickly most investors select the ‘market rate’. At the time of writing this is set at between 3.1% and 6.1% annually. This rate depends on whether you invest in the Rolling, 1 year or 5 year market. To see the current rates on offer head on over to the RateSetter Website*. Once your money has been matched to a borrower, you will then start earning interest. This will happen as soon as repayments on the loan start to be made. While you can withdraw your capital and interest repayments as you go, there’s also the option to automatically reinvest. This could help you make the most of your invested cash and avoid it lying idle in your holding account. What If You Want to Withdraw Your Money? With The RateSetter Everyday Account* you can always withdraw your capital and interest when it has been repaid by borrowers free of charge if you have not chosen to automatically reinvest it. If for some reason you need to access all of your investment, then this is also not a problem – even if your money has already been matched to a borrower – as you can release your investment at any time just as long as there are sufficient funds available from other investors to take your place on any matched loans. Depending on which type of market you are invested in, there may be a small ‘transfer fee’ payable to facilitate this. Is Your Money Safe With RateSetter? Now we come to that other all important question, is your money safe with RateSetter? 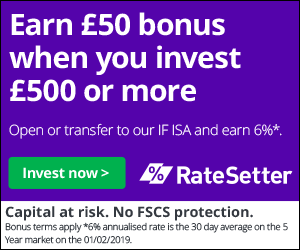 While there is no FSCS protection with RateSetter, they do proudly state that no investor has ever lost money. This is mainly down to their Provision Fund. Please keep in mind, though, that past performance is no guarantee of future success. To find out more about how the Provision Fund works, check out this page on the RateSetter website*. If you’re looking to earn a better rate of interest on your savings and you are interested in the idea of peer to peer lending, then RateSetter* could be a great place to start. First of all, the company have a proven track record of safeguarding investments. The Everyday Account and IFISA also offer a great rate of return and easy access to your investment. All of this means that RateSetter offer an interesting proposition for frustrated savers looking for better returns.